Corn/wheat markets are slightly higher this morning after a heavy volume trade yesterday, running shorts out and prices back to the 50 day moving average for corn and to last weeks mid week lows in wheat. KC/Chicago spreads broke back toward par as well. 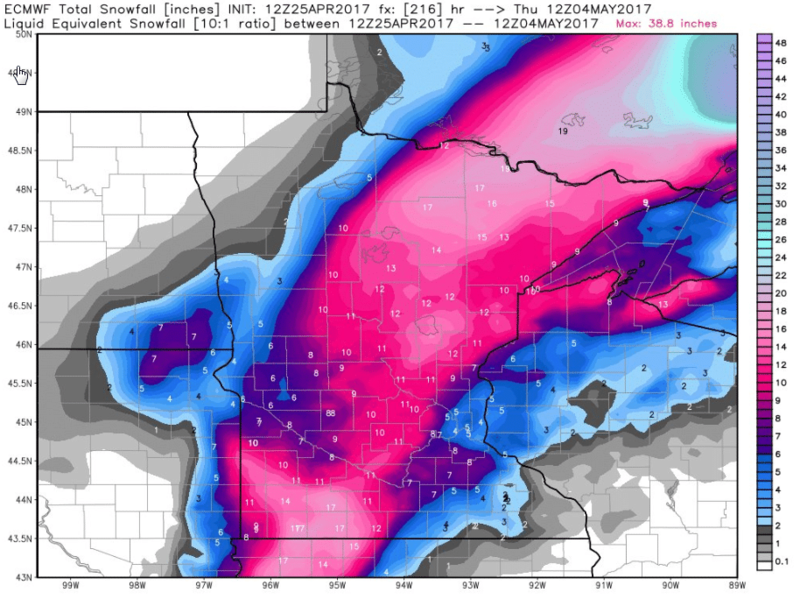 The fund money remains massively short and concerned about the latest model runs for this weekend that could bring snow to parts of NW Iowa and SW/Central Minnesota. July corn needs to close above 375 before I would get excited above moves back toward 390-400 but at this point the momentum feels like it is there. It may take getting through the May first notice day before it happens. Farmers will probably be selling into this given the move and the time wall that exists through Thursday at most co-ops elevators. Minneapolis wheat is the market to watch right now. July futures are sitting right below last weeks high, and below a breakout point on the charts. Spring wheat could show some shortage on the S/D tables if the weather would continue and acres are shed. That should help pull KC over Chicago. I like buying KC/Chi wheat spreads at these levels, I think they provide a lot of upside opportunity with little downside risk if the sentiment would change. US wheat crop tours begin next week in Kansas. Soybeans actually broke on this move higher in corn/wheat. The corn/bean ratio had blown out again to levels seen at the March planted acreage report. Some of the guys here think this “delay” is probably ensuring more soybeans get planted as switching to corn may get nixed, especially up North in the Dakotas. That may have happened anyway, but the cold wet temps that should remain in force for the next week at least is probably keeping a lid on corn acres at 90 million. I think soybeans will eventually join in on a rally with the rest of the row crops, but for now they will be observers. Cotton prices made another run above 75 cents in December, actually closing there yesterday. Short term moving averages (8 day) have held this entire move from 72-75. We are seeing prices slightly lower this morning, but there is little to talk about right now in cotton outside of the recent commentary- fund length, fantastic old crop exports, new crop acreage expansion. The WASDE, which is two weeks away will give us new crop estimates and old crop demand increases, I see neither changing the narrative. Chinese imports for March was down 12% from Feb, maybe China has had their fill. I would be a seller of cotton at these levels given the run to the top of the channel. You have pretty good risk reward for a short term trade if interested. Sell Dec cotton at 75.10 and risk a close above 76.00. There is a MRCI seasonal sell recommendation on July cotton through May, which happens to be underwater right now. I would rather sell Dec though. Weather forecasts will be traded like WASDE’s over the coming week, expect a lot of position shifting as the US markets trade. For the US, its about wet and cold. In Europe, its about too dry in France but moisture appears on the way. Over in Black Sea, dryness is developing. While down in Brazil, Safrina corn is beginning pollination phase amist dry moisture profiles but moderate temps. Markets remain very heavily sold by speculators. Look to sell runs into the 450’s for July KC wheat, 410’s for December corn, and 1010’s for Nov beans. I would be a seller here in cotton for new crop production. If you bought calls yesterday, good on ya…if you didn’t look to buy breaks.